Where can I stream the BMW Championship? Sky Sports subscribers can stream the tournament online via Sky Go. 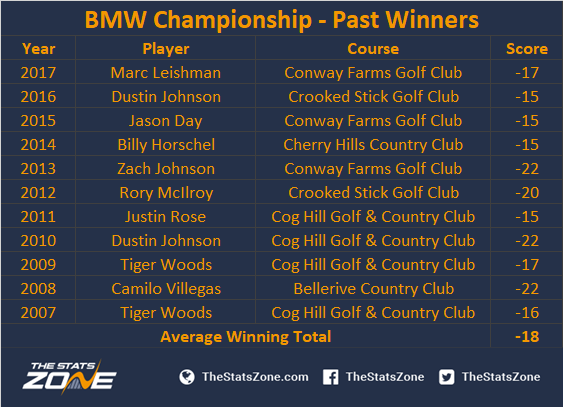 What is the format of the BMW Championship? 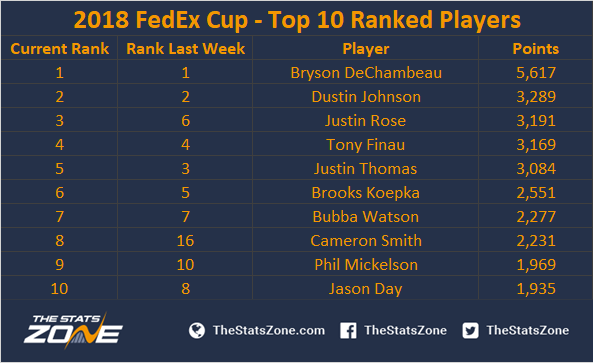 The top 70 ranked players in the FedEx Cup standings are competing this week with just the top 30 progressing to the season-ending Tour Championship. The BMW Championship heads to its fifth different venue in playoffs history. The championship has seen many of the world’s highest ranked players win the penultimate playoff event, so the biggest names will see this tournament as highly important if they are going to claim the lucrative FedEx Cup trophy. Abraham Ancer climbed 36 places into 56th after only just qualifying for last week with his fifth top-ten of the season. A final-round 73 could be costly however in qualifying for the Tour Championship after leading for much of the tournament. A quiet season compared to last year, Hideki Matsuyama is starting to make a move by moving up 30 spots into 28th position after a final-round 65 to record just his third top ten of the season. Rafa Cabrera Bello put it all on the line to try and force his way into becoming a Ryder Cup pick with four solid rounds in the 60s to move him up 22 places into 37th position after a T7th finish and fifth top ten of the season. Emiliano Grillo’s strong season continued with his sixth top-ten of the season to move up 19 spots into 29th with a third-round 64 putting him into contention for Sunday. Tyrrell Hatton continued his good form once again when required, moving up a further 17 places into 51st. A final-round 73 left him in a tie for 12th though after being in second position heading into Sunday. Ted Potter Jr. just made his way into the BMW after dropping eight spots into 70th position with a tie for 66th. The 2018 tour winner must find some consistency after rounds of 74, 67, 75, and 68. European Ryder Cup player Alex Noren produced another indifferent weekend of level par after opening up with two rounds in the 60s to drop seven spots into 50th. Ian Poulter’s chances of a Ryder Cup pick took a slight knock after missing the cut and falling seven spots into 45th. Luke List’s form has dropped at the wrong time of year, falling ten places into 40th after opening with a 76 and missing the cut. Chesson Hadley fell seven spots into 34th after missing the cut due to an opening-round 79. With seven top-ten finishes already this season, he will need to produce some of that form to climbed back into the top 30. The top five ranked players heading into the Tour Championship each have their destiny in their own hands with a win resulting in the FedEx crown. Furthermore, if results go their way this week, any player currently inside the top 50 can climb into the top five with a victory at the BMW. Rory McIlroy ranks 24th and looks to be finding some consistency with his all-round game after a fifth top 15 in his last six starts. Expect Rory to continue that trend this week and put himself into contention. Jason Day currently ranks 10th in the race after two victories this season and five straight top-20 finishes until a MC last week. Expect the Australian to return to form and give himself a chance at the FedEx title heading to East Lake. Cameron Smith has hit form at the perfect time, recording top-three finishes in the opening two playoff events to move into eightH in the standings. Another strong showing this week gives him a shot at the title in the season finale. Justin Rose continued his highly consistent year with a second-place finish to move him into third in the standings. After recovering from a minor back injury last month, Rose looks close to his best again and arguably deserves the overall title after such a good year.